Eleven year old Mikaya Taylor has just recorded her first CD called Small Town Big Heart. She was honored to have Curt Chapman play Bass from the band Flashback, Danny Barnes on Mandolin from the band Blind Ricky, Frank Kemper on Guitar previously from Kentucky Blue and Kevin Chilton on Banjo with Kentucky Spirit. Her album was recorded at Old Time Recording Studio by Danny Barnes and Randall Conn. Ten year old Mikaya Taylor has entered the Female Bluegrass Vocalist World with a Bang. She is being called "Kentucky’s Singing Angel" and has quite a following at area Festivals and on Social Media. Mikaya lives in a small town called Lawrenceburg, Kentucky. She is in the 5th grade. Mikaya has been singing since she was two around the house. The O’Connor Method has been revered as the method to rival, as it combines the art of teaching young children with the teaching of American music. By joining the rich heritage of American music with the art of playing a stringed instrument, the O’Connor Method has the ingredients to stand the test of time in every aspect of a creative string method. 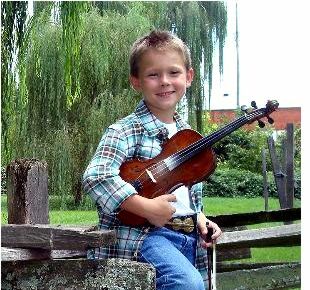 Founded by fiddler, Mark O’Connor, the method is centered around engaging young musicians with American music history. Nashville, TN -- Katie Armiger, Brent Cobb, Chris Janson and Corey Smith, four rising singer-songwriters who have been selected to participate in the Country Music Hall of Fame and Museum’s emerging artist membership program, will take the Ford Theater stage on Tuesday, December 10, at 7:30 p.m. for an acoustic guitar pull. All proceeds from the concert will benefit the museum. IBMA & Youth Council: We Want Ya! World of Bluegrass 2013 was a great time for youth to get together, jam, make new friends, and stay out past bedtime. But it doesn't end there! The good times continue year-round with IBMA's Youth Council, which intends to speak collectively for the youth of IBMA, facilitate youth projects and industry mentoring opportunities, and work to share bluegrass music with more young people. Read more about IBMA & Youth Council: We Want Ya!